These stories are about Sabrina and her sister, Daphne Grimm and are written by Michael Buckley. After their parents mysteriously disappeared, they are sent to live with their Grandma, Relda Grimm. That would have been fine – had not their parents told them they were the only family they ever had. Daphne seems to be having the time of her life and believes every thing their Granny Relda says. Naturally, Sabrina is suspicious, and who wouldn’t be after living and running away – from dozens of foster parents? But, after a giant takes Granny Relda and her body guard, Mr. Canis (who is a part of the secret fairy tale community called the Everafters), Sabrina and Daphne rush to the rescue joined by Puck, a villain (or so he says), from A Midsummer Nights Dream and Jack (the Giant Killer). Together they go in search of Mr. Canis and Granny Relda and look for a secret Everafter community called The Scarlet Hand and meet all the fairytale characters they could ever hope to meet. What I like about the series is how the author describes every thing. For instance, he gives a complete description of the characters, and he clearly describes the scenery and what is going on. I also like the plot a lot. He clearly describes what is happening, and I understood what was going on. It keeps me on the edge of my seat and wanting more, because every book ends in a cliff hanger. For instance, in the first book they don’t find their parents, and it leaves you feeling like you have to read the next book. In the second book the author ends the book in the middle of a sentence. What I didn’t like is that he used a little “potty humor,” and Sabrina fought a lot and called people names all the time – although they weren’t necessarily bad words, they weren’t kind names. Also, he uses jokes that aren’t very funny. I’ve read the whole series. Each book has action and adventure. The recommended age range for these books is 7-13 years old, but I recommend them for ages 11-adult or that a parent read the books first. Hi Kenna, great review. I like how you described both what you liked and didn’t like about the books, and how you gave advice to parents about reading them first. I’m sure they will appreciate that. Keep up the good work! 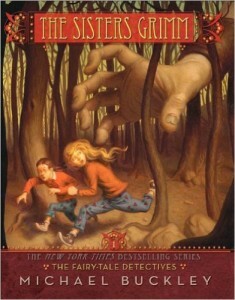 C.
hey, for my lit class i read grimm’s fairy tales and it was soo gory, my mom said she would not read any more! soooooooooooooooooo gory! I believe you are thinking of a different book. My book review is about Sisters Grimm and not Grimm’s Fairy Tales.